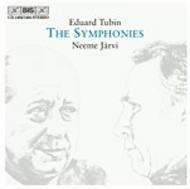 Symphony no.4 in A major, "Sinfonia lirica"
Neeme J�rvi�s survey of the Tubin Symphonies is here packaged shorn of some of its couplings and presented in an attractive and competitive format (five CDs for the price of three). These are marvellous works, rich in invention and with the real breadth of the symphonist about them. Anyone who is attuned to the symphonies of Sibelius or Prokofiev will find themselves at home in this world.